You Can Go Back - The Fund for New World Development, Inc.
Carol and Sherwood Guernsey, founders of the Fund for New World Development, served in the Peace Corps from 1969-1971 in a small rural village in Panama called “La Laguna”. The village stretched out along the only paved main road running from the large town of Las Tablas to Pedasi, a town near the end of the Azuero Peninsula. Carol worked in the Azuero Women’s Program which focused on the women’s and children’s health; Sherwood (known as “Miguel” in Panama) worked on projects to improve agricultural diversity and modernization of agricultural practices. Their two years in La Laguna were one of the most meaningful times in their lives. When they left, they felt that they left many very dear friends. However, as life back in the U.S. evolved, with graduate school and professional careers, they thought that their friends in Panama would not be able to relate to them in the same way anymore, and wanted to cherish their time in Panama as important and special, but to not continue contact. However, after 40 years, they got curious. What would La Laguna be like now? Would people remember them? Was there a way that they could work with the village again that might help to improve lives? So they went back. One day, Carol and Sherwood walked into town with little warning, and it was just like old times. The people of La Laguna had become family, and they never forgot. They welcomed both Carol and Sherwood with open arms. The town had changed, but yet it hadn’t. The “casas de quincha” (mud and straw) were mostly gone, with their roof tiles sold off to the new hotel owners in nearby Pedasi and replaced with cement block houses with tin roofs. Nevertheless, the little mud house they had called home for two years was still there. The biggest changes, however, were running water in each house, electricity, and stoves. The women in particular seemed “liberated” from time consuming strenuous activities: they no longer had to spend their days finding firewood and trekking to the river. But the people, the music and the culture were all the same. 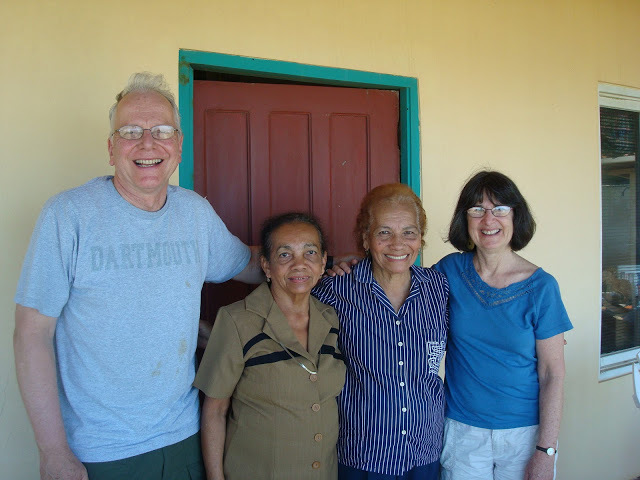 After plenty of “paseando” and “celebrando”, Carol and Miguel told their Panamanian friends that they wanted to work with them again to help the village in whatever they thought it needed. They called a community meeting and more people came than ever came to a meeting 40 years ago! They prioritized computers for the town and school, English classes, a baseball field and blinking lights along either side of the roadway to warn motorists of a school ahead. There were no computers in town and no internet, not even in the school. And, there was no place to play their favorite sport: baseball. (They had been playing as best they could on a field full of road construction materials, with a metal pipe for a bat and only a few beaten-up old gloves). People were very eager to participate. Committees were organized for each project, to be coordinated through their old friend and teacher, Flor de Maria Prado. There was a lot of work to be done, and by “going back”, they have been able to “move forward”.